In 2014, West Africa fell victim to what would become the largest Ebola outbreak in disease history, with more cases and deaths reported than all of the previous outbreaks combined. In an attempt to contain the contagion, field workers in Africa began retracing human contacts of known patients. When people are identified soon after exposure, they can be monitored for symptoms during Ebola’s 21-day incubation period. As a result, the odds of preventing further spread vastly improve. But how do we contain the entire epidemic? The information needed to respond to Ebola must spread faster than the disease itself, say our partners at Columbia University’s Earth Institute. “The way information is collected and shared is fragmented and terribly inefficient,” said Anne Liu, the Earth Institute’s associate director for health systems development. In order to interrupt Ebola’s chains of transmission, workers must be able to share critical data almost instantly. Fast access is mission-critical. We’re working with a disease where time is of the essence. If you can’t control the contact tracing, you can’t control the disease. Understanding this sense of urgency, Dimagi, a Massachusetts-based private social enterprise, brought its CommCare informatics system to West Africa. The mobile data-collection platform works both in real-time and offline—a vital function in a region with fragile networks and unreliable connectivity. To enable fast data sharing, we stepped in with a grant to deploy Tableau Server and Desktop along with training help. Tableau Zen Masters quickly created dashboards to help field workers track and monitor transmissions. Summary dashboards allow all agencies to understand the current state and progression of the outbreak. 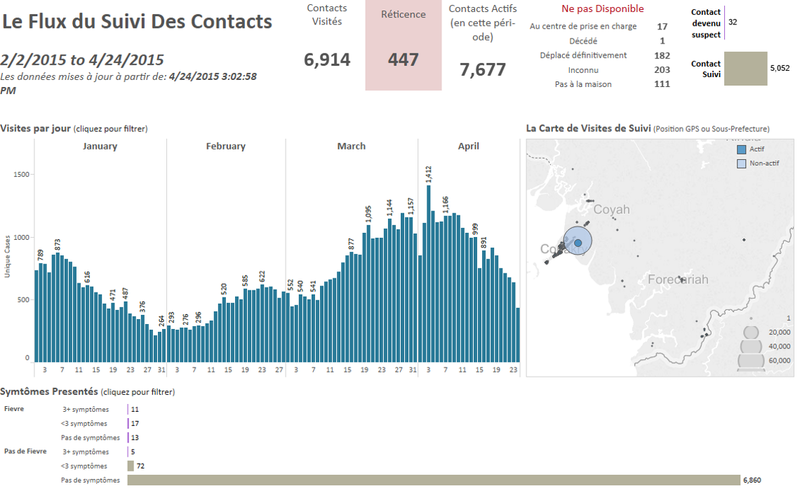 Empowered with Tableau, Dimagi is gaining ground in the fight against Ebola. Ericsson, another Dimagi partner on the project, provided smartphones loaded with the CommCare software to contact tracers in the field. The Earth Institute and Partners in Health also pitched in to help. The resulting insights quickly proved valuable to officials on the ground. Guinean health ministers began consulting Tableau dashboards when deciding where to direct resources.